This week I finished up two books, The Happiness Project by Gretchen Rubin and Quiet by Susan Cain. "According to current research, in the determination of a person's level of happiness, genetics accounts for about 50 percent; life circumstances, such as age, gender, ethnicity, marital status, income, health, occupation, and religious affiliation, account for about 10 to 20 percent; and the remainder is a product of how a person thinks and acts. In other words, people have an inborn disposition that's set within a certain range, they can boost themselves to the top of their happiness range by their actions. This confirmed my own observations. it seems obvious that some people are naturally more ebullient or melancholic than others and that, at the same time. people's decisions about how to live their lives also affect their happiness." Each month, Gretchen focuses on a different subject and explains what the research says, how she implemented it, and how it went. Some chapters I was able to connect with and gleam some insights from, and others were just too far removed from my reality. It is worth noting that Gretchen is married, wealthy, non-religious, has two school age kids, and works from home as a writer. I would bet that the more you have in common with her, the easier to relate to the book as a whole. Although I had to trudge through some of the less interesting (to me) parts, I am glad that I read the book and have some ideas about how I might implement some of the things into my own life. We'll see if I actually follow through on that! Quiet was a great read for me. I have known that I was an introvert since the summer after my junior year of college. I was working at my parent's church doing youth ministry and the church had hired someone to type all of the employees using Myers-Briggs and then conduct a day-long training on how to use the results to improve the working environment. I tested as an ISTJ, and still feel this is a pretty accurate description, except that I have switched from T to F. At that time my T and F were pretty close, but my life experiences as a high school teacher have pushed me squarely into the F camp! 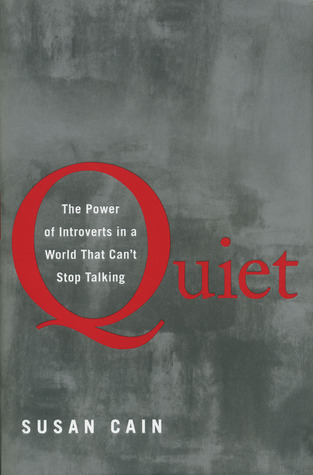 The subtitle of Quiet is The Power of Introverts in a World That Can't top Talking and I think this accurately captures the content of the book. It starts by examining the historical context of how the U.S. has become a country that values extroverts and then looks at the research that shows how vitally important introverts are. The book is filled with summaries of the research and examples to help illustrate the concepts. The true beauty of the book for me was how it helped to explain to me a lot about my feelings, actions, and motivations. It gave validity to the way I approach the world and research-based suggestions for how I can work/live best. I would highly recommend this book! And it's not just for introverts! The research presented could help extroverts interact better with introverts. not at all surprised... John is also an ENFP! However Phil was ISFJ! Opposites do attract! And we change over the years. thanks for sharing the article! the perspective on Gretchen was helpful. (and the article in general is great) One thing I've also been thinking is that Gretchen seems to lack purpose in her life. In my opinion, this is probably from her lack of belief in God. I read the Happiness Project once. At the same time I read All the Money in the World: What the Happiest People Know about Getting and Spending. I found the latter to be very impactful on my opinions of what constitutes happiness. All those studies on happiness are fascinating! My husband is reading Quiet right now! I borrowed it for myself but the title grabbed his attention and he is reading and hasn't stopped talking about it!! He loves it and understands himself (and some of our children) much better!